For our third exploration, the Provost, Dr. Steven Blume, about 30 years ago at St Johns River CC required all student incoming to take his short version of the Myers-Briggs along with the state mandated CPT. Dr. Blume, before he became a President/Provost had spent 20 years earlier in his life as a Psychology Professor at the University of Texas and developed this short 20 question version of the 114 question Myers Briggs Personality Inventory. His Sample was over 100,000 participants over a ten year research period and proved that his short version gave 99% of the time the same results as the 114 official copyrighted Inventory. He made this test free for all colleges to use. When I met him in the 1990 at the Florida State Developmental Conference, I volunteered to computerize his inventory and published it online for free so that professors may use this version to get to know their students better. This was during my period of helping to develop Student Success programs at the college I worked at down state and while I was taking graduate computer classes at the University of South Florida (It took me six months to complete in 1998). There are several short versions created by other scholars who have demonstrated their abbreviated form produces the same result as the lengthy MBTI. This form is just one that is in use. For my students you may do this exercise at home, then send the screen prints of the results as attachments with an email. The Myers-Briggs Type Indicator® (MBTI) is a self-report questionnaire designed to make Jung's theory of psychological types understandable and useful in everyday life. MBTI results describe valuable difference between normal, healthy people-difference that can be the source of much misunderstanding and miscommunication. The complete form is 114 questions and informational input on a special form. It is copyright protected and the user has to pay a couple of dollars to complete the assessment. It takes between 20 and 30 minutes to complete. The MBTI will help you identify your strengths and unique gifts. You can use the information to better understand yourself, your motivations, your strengths, and potential areas for growth. It will also help you to better understand and appreciate those who differ from you. Understanding MBTI type is self-affirming and enhances cooperation and productivity. Then send me screen prints of the results and conclusion. 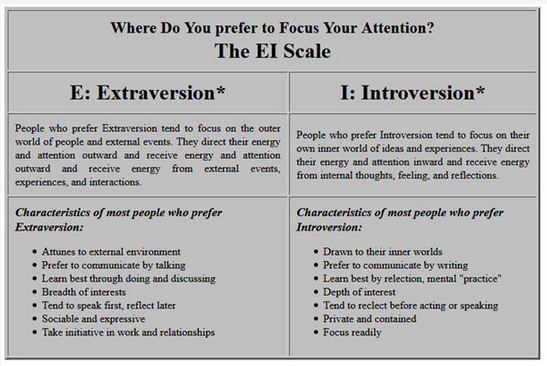 And the Analysis of the above results indicate I am an ESTJ type. PS: I agree with the above analysis. Also, I just noted a misspelled word in the inventory. Also a missing comma. I have lost all my paperwork from Dr. Blume and I am certain he has since passed. Please note the footnotes on these scales. I hope you have "fun" exploring this inventory. Remember, it is Confidential between you and me!